I’m going to kick this post off with a confession. I hope you’re sitting down, because this might shock you. Ok, are you ready? Brace yourself…. I’ve never used pure Coconut Oil for beauty purposes. I know. Considering Coconut Oil is one of those absolute wonder products, it’s a bit of a wonder in itself how I’ve missed out for so long. Coconut oil is a great natural way of tackling that dreaded dry skin that tends to hit as cold weather and hot indoor heating combined make your skin dryer than the Sahara. So whether you like using your own home-made skincare remedies or if you like to choose products that include it, it’s perfect!. Coconut is something most people associate with summer and hydration, as coconut water is that amazing dehydration fixer (or hangover cure) and the scent of sun cream and after sun often have a bit of that coconut/holiday scent. Well, take those hydrating properties and add them into your winter skincare routine and you actually have a bit of a dream team,. Especially in that ‘post Christmas’ recovery period! I’ve been adding some coconut into my winter routine for the past week in the form of three Jason skincare products. Now, before I tell you about these little gems, I wanted to give a quick shoutout to another Jason that I came across a couple of months ago. My lovely dog sitter Vicky (who looks after Monty & Willow when I’m off at meetings etc) bought a dandruff relief shampoo and as we had talked about a few beauty bits before, she passed it on to me as I have a sensitive scalp and I am SO glad she did as it’s fantastic –like a good detox for the scalp! So if you tend to have a sensitive scalp like me, I would definitely recommend trying it out. ANYWAY, I digress from the coco-nutty goodness – I just wanted to throw a mention in there because it really did work for me and gave me a sort of pre-founded confidence in the rest of the Jason product. Jason skincare is a brand that really prides itself on its ingredients and excluding any ‘nasty’ additions from its final products. 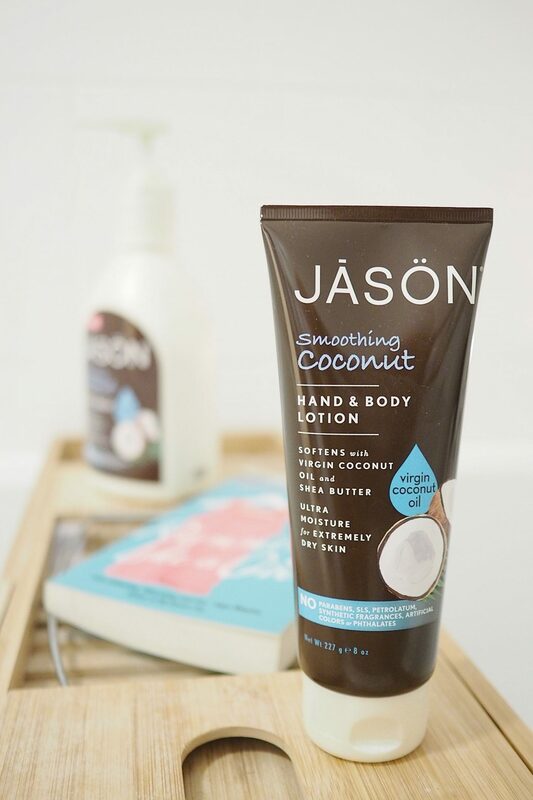 For example, the Jason Smoothing Coconut Hand & Body Lotion, Body Wash and Smoothing Coconut Oil I’ve been testing ALL contain no parabens, SLS, petrolatum, synthetic fragrances, artificial colours or phthalates. The core ingredient in each one of course being unrefined virgin coconut oil. The scent of the products is one of the things that struck me the most. It has a sweetness and something recognisable, but it’s not one of those artificial coconut scents you’re probably familiar with. It’s actually sweeter in a way, but softer too. I find this a really comforting feeling as it’s not strong enough to linger so doesn’t interfere with perfumes or other fragrances you might want to layer on top. The other thing I noted with the body wash was how it doesn’t lather in the same way as normal body washes, which is probably why it has more of a nourishing feeling to it. By taking out those sulphates that create the lather you’re left with a creamy texture that doesn’t strip skin and instead leaves it feeling clean and soft. I then top this off with the Coconut Hand & Body Lotion which has a gorgeous rich texture, it’s quite thick – definitely thicker than a traditional lotion so I feel like it’s making a difference straight away. Once it’s dry it soaks right in and leaves skin feeling hydrated and soft all day long. The range is also formulated with nourishing vitamin E and antioxidant polyphenols. The combination of these three products work a treat for parched, dehydrated winter skin. In fact, as I sit here I was just stroking my arm to see how the skin was feeling a good day after use during my morning shower and it still feels just as soft as when I first put it on. I mentioned early on how I haven’t used pure coconut oil much myself before this past week. I’ve since found a couple of ways that work really well for me so I wanted to share them. If you’re (like me) partial to a gel manicure, but like to take a break every now and then, this is when coconut oil can come into its own. About four days ago, I removed my latest gel manicure and found my nails and cuticles in need of all the moisturising help I can give them. I’ve been using the big tub of coconut oil as an intensive cuticle treatment by massaging the coconut oil around each fingertip and it’s worked a charm! During these harsh winter months, hands and feet need as much help as possible to prevent the skin from drying out and cracking. Taking a scoop of the oil and massaging into hands and feet before covering in socks or gloves and getting a good night’s sleep is a good way to give them a treat whilst you snooze. Bonus being you avoid getting oily marks everywhere whilst you try to get on with life! I know people with dry hair tend to pile on the coconut oil and it works wonders. For me, once a week is plenty to give my hair some silky hydrating without leaving it *too* silky which often results in a loss of volume. All I do here is take a small lump (around the size of £1 coin), let it melt in my hands and run through the ends of my hair. Then I tie into a bun and leave overnight before a double shampoo in the morning, followed by conditioner. End result – silky smooth, hydrated hair! The next trick I recommend you to try is a custom made hydrating scrub. 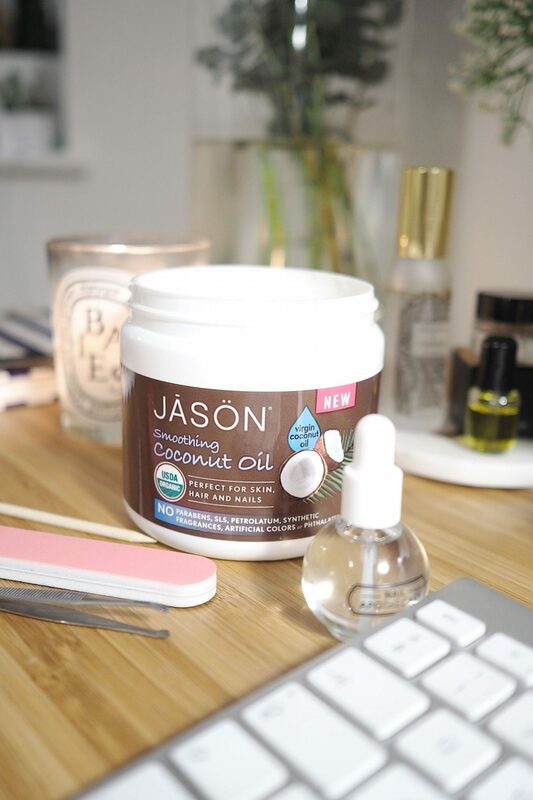 Mixing up the Jason Coconut Oil (100g) with some Brown Sugar (100g) and Sea Salt (150g) is an easy way to create a scrub base – plus a few drops of essential oils in order to create my own custom scent. I like all things minty fresh so I always opt for peppermint oil! There really are so many ways you can add coconut oil into your body care routine to feel silky smooth from head to toe – particularly during these cold January days!